My friend Stephanie and I went on a tour of all the Civil War sites and we went into the woods because when I took a picture of one of the battlefields, the flash reflected off something shiny and we went to go and see what it was. We had stumbled on an old civil war graveyard (the death date and birth date were still legible on one of the gravestones). It was obviously snowing when we went and I thought that it would make a neat picture, so I took one. When we got back to the hotel room, I dumped the pictures onto my laptop and put a black border around the picture. When I had finished I got Stephanie to look at it and she noticed the man in the upper left-hand corner of the picture. It was just Stephanie and me there and we didn't have a tour guide. The man in the picture is obviously not dressed how we would dress so that means that he can't be from this time period. We had free internet and decided to look up the clothes from around that period. They didn't match. Then Stephanie showed me a picture that she had taken and the date on the nearest gravestone said 1891 as the death date. The name was Mary Shirtliffe. We also looked at the clothes from that period, and it was a match. We also looked up Mary Shirtliffe to see if she did anything special throughout history. She was a female surgeon in a Confederate field hospital that was set up there. And they buried the dead using rocks that Mary found because she didn't think that just a board was enough. The hospital moved with the Confederates to the next camp and the bodies were left there. Mary recorded the location in her diary to tell the families where their loved ones were buried. She later said in her will that she wanted to be buried there too. Her husband was Robert David Shirtliffe and he often visited her grave. This is who we saw. 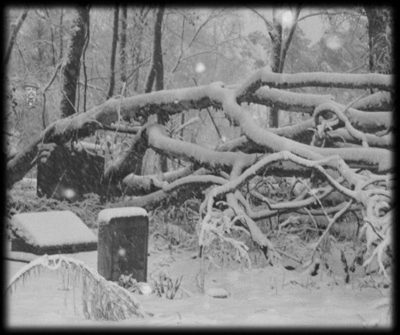 The tree has fallen on top of her grave so you can't very well see it. Creepy Huh!!?? Very Good pic! Well defined image of a gentleman standing on the left looking back at you. It`s as if he`s glad to see someone present there at the Grave Sites. I`m Impressed by this. You see the big branch in the middle? Well look where the 2 branches overlap anyone see a small girl? I am suspicious anytime a "ghost" looks like he is posing for the picture. The figure WAS posing for a picture. The very picture which was put into this winter landscape with photoshop. And it's not a difficult task to put a figure behind an object. It's easy with PS. To those claiming this was photo shopped: only one problem with your claim. The tree limb is IN FRONT of the image. If the image was photo shopped it is a really really good one so much so that attention to that detail was brilliant. I personally think the majority of these photos are crap and lighting anomalies. But this one has me feeling it is genuine. By the way I have seen ghosts five times in my life and due to that, have no doubt they are real. That's gotta be one of the realest ones I've seen/ It almost looks like a real person till you look closer and notice you can't see right through him. Nice find. This is obviously a photo shop pic the man standing with the hat looks like an app I have on my phone this would be interesting if it were real but I'm sorry folks its been touched up to fool the weak minded. I rate this pic 5 stars for imagination. It is a real ghost!!! That is one of the most clearest and noticeable ghost I've ever seen. You can clearly see his facial features too. I am amazed by this picture and I want to see something that clear if I ever go to one of these Civil War battlefields. This is the best example of the kind of ghost sighting I also had. The ghost was just like this one in the picture but different. I slammed on my brakes to keep from hitting him and only when he went through my car did I realize he was a ghost. I totally believe this is an actual ghost sighting great pic thank you! Some have already noticed the man. And then the one in the back. One even saw a face of a woman,(didn't see that one) but if you look right in the front (follow the soldiers face) and you look at the bottom of the picture, in the snow is what looks like a shoe footprint also it continues into a transparent leg. And if you look at the soldier in the back between the trees, you see a white straight transparent arm infront of the tree and the soldier, its the arm of the person that right in front of the camra. Anyone else see it? Matrixing. Once again don't try to see things. If it's there you see it at once, trust me. I believe this one. Maybe he's an old school gunslinger? Cool thought eh? To the left between those two trees is a man's face with one of those rounded-off bullet hats from the olden days...my little brother and I were looking at this and figured it was cool, then he just jumped and took a few steps back from the computer and showed me what startled him. A it's pretty freaky. Its easy to match pixels, The lighting on the ghost is brighter than his surroundings and he is in better focus than anything else in the photo. (photography terms: He's in too sharp of focus for the sharpest part of the depth of field of this photo.) Nice piece of artwork though! This is amazing! I was looking at all the pictures on this site, and I saw this one. The figure doesn't seem to be photoshopped in, and you can tell that he wasn't standing there when the picture was taken, because if you look at him carefully, he has no feet. Also, If you look at him, the only part that appears to be solid is his head. The body appears to be almost transparent because the texture of his suit and the texture of the background is exactly the same. Amazing picture! I opened this photo in my own Photoshop and magnified it. The pixels of the image of the man and the rest of the photo are all the same size. I could not see an edge around the man in the photo as I would have expected to see if he had been Photoshoped in. It's an amazingly beautiful photo to begin with, with the fun element of---gee, maybe this is the real thing. I find myself wanting to believe. Please don't tell me if it's a fake! The thing about ghost pics you have to understand they aren't all misty vapors and or dark shadows. I have seen few LEGIT photos which weren't photo shopped where you see the ghost as clear as day. A well known one was from tombstone Arizona. You see a man standing in a field dressed in an outfit dating back to the "wild west" days. The only thing was his legs weren't there. It wasn't Photoshopped (it was tested). Personally when I saw this I thought "oh this is fake". But like I said it isn't all misty vapors and shadows. I gave it 5 stars, ghost or no ghost it's still beautiful. If it IS indeed a hoax, I wish people would stop hoaxing ghost pics. It's different from others I have seen. I dont understand why anyone would go through all the hassle of photo shopping a picture to put it on a site. I think its legit. This could be one of the Holy Grail kind of photos that we would all go giddy over! However much I looked at it, there was one thing that really stood out to me... Why would a ghost present itself in the utmost clarity... And leave his legs absent? It's solid all the way to where the thigh is, and then tree branch and then nothing. Hope I'm wrong cause it's a cool wannabe!!! You just totally hit ghost gold! A full body app. is rare even for ghost hunters! It is very amazing! Plus if you look at the tree it looks like there is a colonial soldier standing near the back! I am sorry, but this is not real..The face is too clear and is a contradiction to the misty clothes. I'm not an expert at this picture stuff....but it looks fake. Looks like a woman's face to the left of him if you ask me. It's an awesome pic. I see no malfunctions. Looks real to me. Ya know, if ya fake it. The pixels are different in the photo. If Photoshop is your only graphics editor, the word Photoshop will be on your pics. Doesn't automatically mean it's fake. Also, it said slices, not splices. Again, doesn't automatically mean it's fake, she did say she put a frame around the pic before the "guy" was noticed. She may have even saved over the original. I'm not sure how Photoshop works, but Paint Shop Pro is very similar and in order to add a frame with PSP you have to add a layer to the pic first. However.... if it's real, cool pic. Although it is a very nice pic, I agree with Tom. I opened it with MS Word and the words "Photoshop" and "splice" jumped out at me like a live snake. This is obviously a Photoshopped photo. By cutting out the figure of a man from a vintage picture, and then making it transparent using Photoshop, it can easily be placed in any photo. I vote Photoshop but gave 3 stars for the nice winter photo and 1 for the little skill it takes to make such a pic. Wow, if that's not a hoax, it's one of the best captures I've seen. This is phenomenal! You should definitely see what you can do to send a copy in with that specific site... It would be amazing if they could compare this picture to whose grave that is to see if it matches. Good find!! Cool picture. I just wanted to know if anyone sees the face above the figure of the man on the left. It is higher up and right by the tree to his figures right. Looks like a mans face. that man was a bit creepy but.......... its hard to believe its real or not. but i gave u a 4 * anyways. Awesome capture. Curious as to when this photo was taken and the name of the Civil War Battlefield. Was thinking that the National Parks Service should have done a better job preserving and maintaining the grave stones, and would have cleaned up the fallen tree branches before any damage was done. Best photo I've seen in a long time. I like hoax photos too. Maybe it is real, I don't know.